Each format works well on both desktop and mobile (with the exception of the large mobile banner). This gives advertisers the opportunity to appear on a variety of screens which increases demand, upward auction pressure, and potentially even earnings. 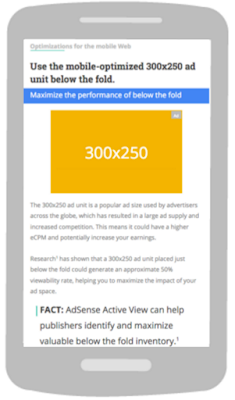 The large mobile banner will also allow 320x50 display ads to appear within this format, which increases competition. 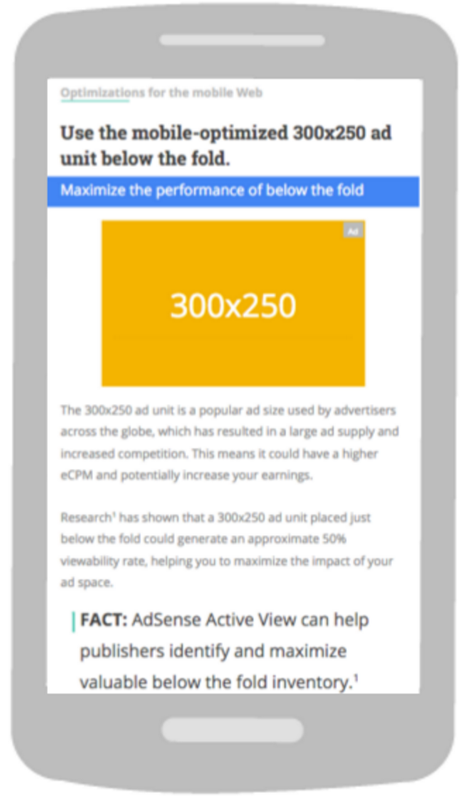 If the 320x50 ad unit wins the auction, it will always be vertically aligned to the top. These formats are bigger and more engaging than smaller mobile units, so they'll grab user's’ attention. Here's an example of what the medium rectangle looks like placed above the fold, yet below the main content. For additional changes for incremental revenue gains, you may want to consider trying link units. Link units are designed to be responsive, so they work with both mobile and desktop. You can add up to three link units in addition to the default limit of 3 ad units per page. However critical mobile is to your business today, it will be more critical tomorrow. Energize your mobile strategy today by using high-impact mobile ads, they’re a great way for businesses to generate more revenue and engage your users. Be sure to follow us on Google+ and Twitter we’d love to hear what’s working for your mobile business. Until next time. We’re paying special attention to improving the mobile ad experience to help empower content creators, news organizations, and publishers. As mobile continues to grow, choosing high-impact mobile ads are key for businesses to generate revenue from a mobile audience. When choosing the right mobile ad units for your business, it’s a best practice to ensure that each and every mobile impression receives the highest value possible, which can be determined by a mix of metrics like viewability, size, placement, and demand. It’s also important to protect the user experience by choosing the right ad formats and placements for your site to engage mobile users so that you don’t interrupt their desired intent.